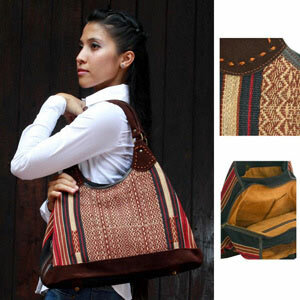 The Naka's artistry comes alive in this versatile shoulder bag. 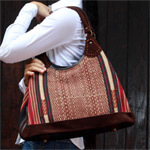 It is handcrafted by Chirada Loetparisanyu with quality suede, Naka's cotton fabric and leather trimming. The generous interior is fully lined with velvet and features three large compartments. The central compartment closes with a zipper and features three pockets, one to hold a cell phone and one with zipper. The other two compartments close with magnetic snaps. The bag stands on brass feet. The Naka people leave in the north-west of Burma and the north-east of India. They are expert craftsmen. This handmade product may vary slightly in colors, motifs, weight and size. Color discrepancies may occur between these products and your computer screen. Materials: Cotton 55%, velvet (cotton) 30%, suede15%.